Two trainees from Graduate School of Professional Legal Education at Magee are about to embark on a trip of a lifetime after securing placements in public interest law offices in the United States. 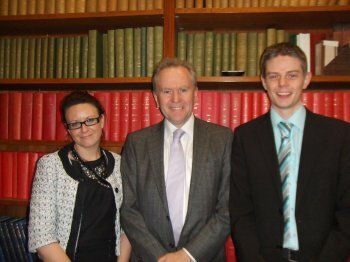 Keith Dunn from Coleraine and Carla Rogers from Derry were among the five GSPLE trainees shortlisted to appear before the Senior Coroner for Northern Ireland, Mr John Leckey, in Mays Chambers in Belfast. Their appearance before Mr Leckey was the final stage of a Public Interest Law competition organised by the Graduate School, explains Paul Mageean, Director of the GSPLE. Mr Leckey selected Keith and Carla as the two best advocates appearing before him, although he acknowledged that it had been a difficult decision as the standard of advocacy from all five finalists was very high. ”Keith and Carla, who graduated from Queen’s University Belfast and Trinity College Dublin respectively, will take up their short placements in the United States in May and June. Keith, who is currently serving his apprenticeship with Hillary Carmichael Solicitors in Derry, will do his US placement with the Legal Defense Fund of the NAACP in New York. Carla, who is apprenticed to the Law Centre in Derry will complete her placement with the Equal Justice Initiative in Montgomery, Alabama. Congratulating Keith and Carla on their success, Paul Mageean, said they had both worked tremendously hard to secure their placements and thoroughly deserved their success. “I am sure they will learn a great deal from this experience,” he said. Mr Mageean also thanked the Senior Coroner Mr Leckey for his assistance with the competition and Atlantic Philanthropies for funding the placement programme. The Graduate Law School at Magee provides full-time training to law graduates who have apprenticeship places in solicitors’ practices.Ã¢€¨Its opening in March 2009 marked a significant milestone in the development in professional legal education in the North West. The Graduate School has its own dedicated space at the Magee campus with customised interactive and recording facilities. The School has recruited a team of experienced legal professionals on an associate basis to deliver the core subjects of the course and give trainee solicitors the benefit of their professional experience. It also ensures a tangible link between the Graduate School and ongoing developments in practice.